Click here for the original Farmer's Wife Magazine, the letter written by Chatterbox in Virginia can be found on page 41. On April 27, Guernica Spain was bombed during the Spanish Civil war, resulting in the deaths of between 126-1,654 civilians. Guernica is located in Basque and was thought to have been a center of resistance to Franco's government. The majority of he casualties of the bombing where women and children, as most men fighting Franco's forces outside of the city. On behalf of the Franco, the German Luftwaffe carpet bombed the city with the express intent to target citizens in order to break the will of the city to resist Franco's Nationalist party. Picasso's "Guernica," approximately 11 x 25" and is located in the Museo Nacional Riena Sofia in Madrid. The day after the bombing, Nationalist news radios broadcast that the citizens of Guernica had actually been the ones to destroy the city in a kind of scorched earth policy using napalm and dynamite. Franco's media also reported a total of 12 casualties. The entire incident had been covered up or denied by both the Spanish and German governments until the 1970's. The bombing also became the subject of one of Pablo Picasso's most famous anti-war paintings named after the city. America had a more relatively peaceful month. Cities were not carpet bombed with incendiary bombs, but parts of the country did deal with workers uprisings and strikes. General Motor Company and the Fischer Body Plant, both in Detroit, faced strikes and sit-ins by thousands of workers and ended violently. The Bureau of Labor Statistics chronicles more than 4,000 strikes took place. One of those strikes stands out from the rest. The strike at the Hershey's Chocolate Factory was started by workers and was ended by workers. Pennsylvania Chocolate workers strike lasted 6 days until the Hershey's Chocolate Factory was stormed by dairy farmers and other Hershey employs forcefully removed the strikers participating in the 6 day sit in. The workers on strike had been protesting for job security and against scheduling changes that reduced a full work week from 60 hours to 40 hours, a limit impose by Roosevelts' National Recovery Administration. The loss of 20 hours per pay check was a huge hit to those worker's income and ability to provide for their families, especially during the Great Depression. Hershey's had a reputation for being a benevolent corporation and offered a pay increase, but sit-ins and factory shutdowns happened anyway. Not everyone at Hershey's supported the strike, less than 1/3 of factory employees participated, and after 6 days of forced shut-downs, these employees had had enough and gave an ultimatum to the strikers: leave by 1 pm or be forcefully removed. Because of the strike and it's shut-downs, all employees were loosing pay, especially the dairy farmers who supplied the factory and were forced to waste 800,000 gallons of milk every day the strike lasted. The strikers where forcefully removed by their co-workers, resulting in a tense and awkward work environment after the entire situation had been mediated and chocolate production had resumed. As a note on the Letter To The Editor, I'm fairly sure that I was Chatterbox in a previous life! Piecing the Jewel block was nice and easy! I did not list any pre-cuts for this block because there are no regular shaped pieces. I cut out the fabrics according to the paper templates. I'll admit that I left about 1/8" edge of extra fabric just in case, but trimmed to a proper 1/4" seam allowance after seams were sew. I also thought that a monochrome color scheme would look nice. Considering this block was titled "Jewel" I decided to try my had at replicating a jewel-like block. Since Opals are the only multicolored jewel that I know of and wasn't interested in trying, I went for a sapphire, my birth stone. The block ended up not looking like a sapphire, but I still think it's pretty! It might not look like it, but this block only uses strait piecing. Handsomepants thinks I'm crazy because he only see's strait seams, but to me the Jewel block looks like pieces are slightly curved. 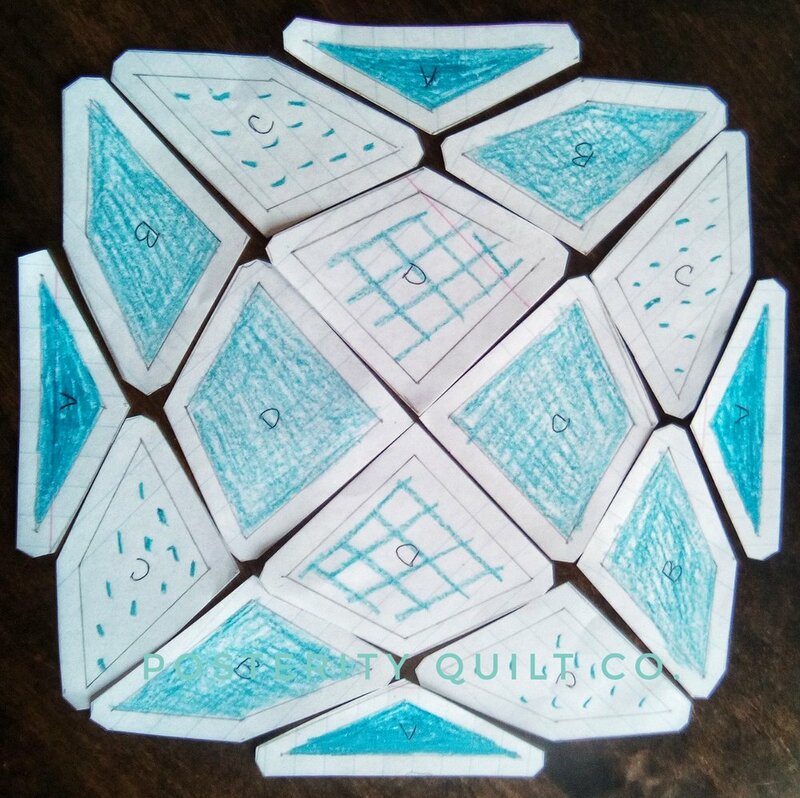 I know that some quilting patterns are designed to take advantage of optic illusions, whether the Jewel block was meant to do this or if I really am just crazy, I don't know. Tell me what you think! 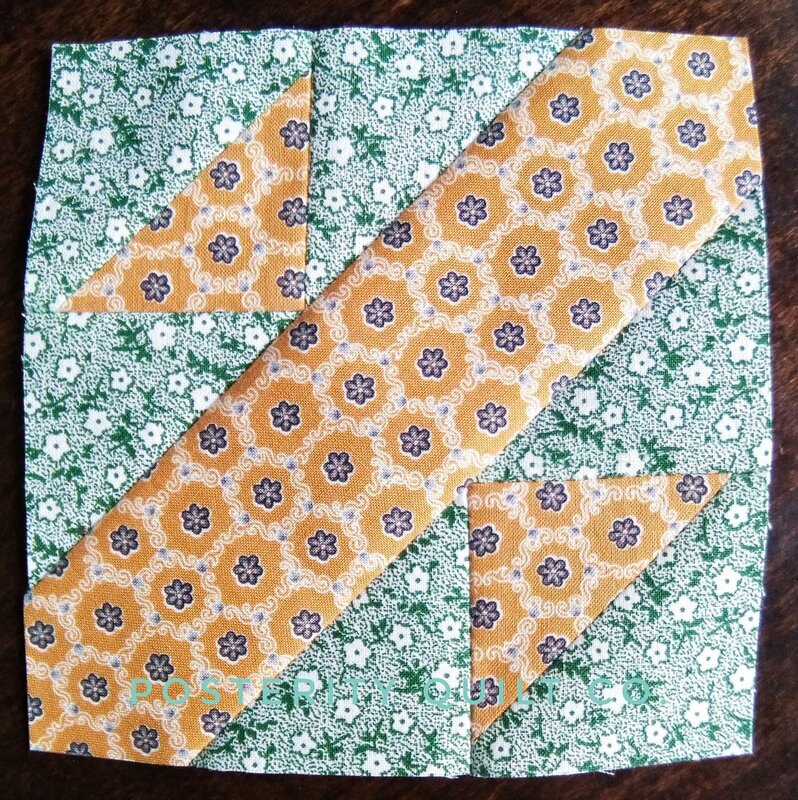 Needless to say, piece this block into HST quarters, first by sewing the A and B pieces together, and the C and D pieces together. 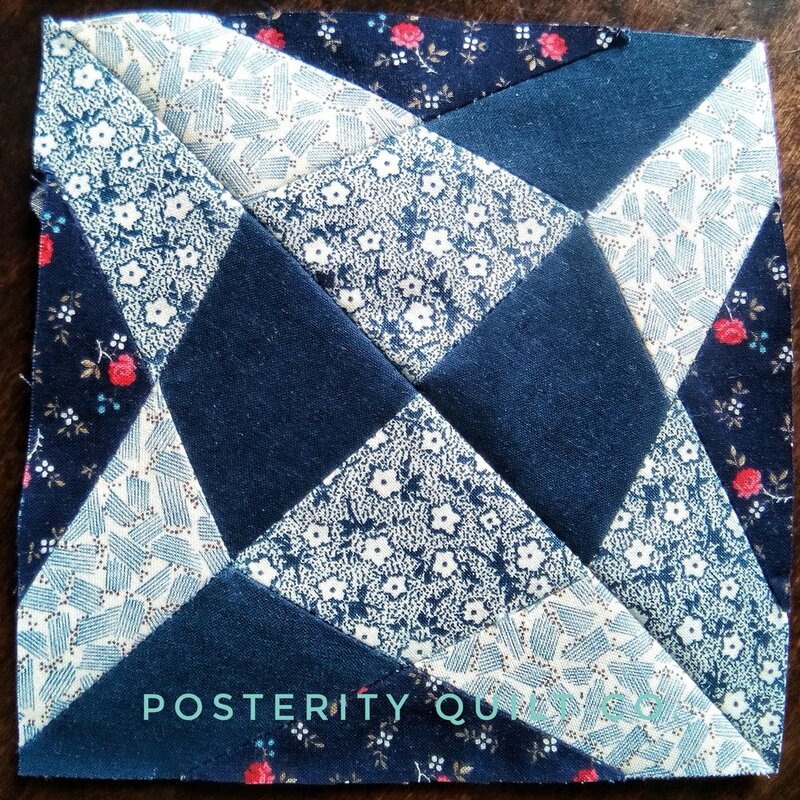 Join these 2 new larger pieces together to create an HST quarter. 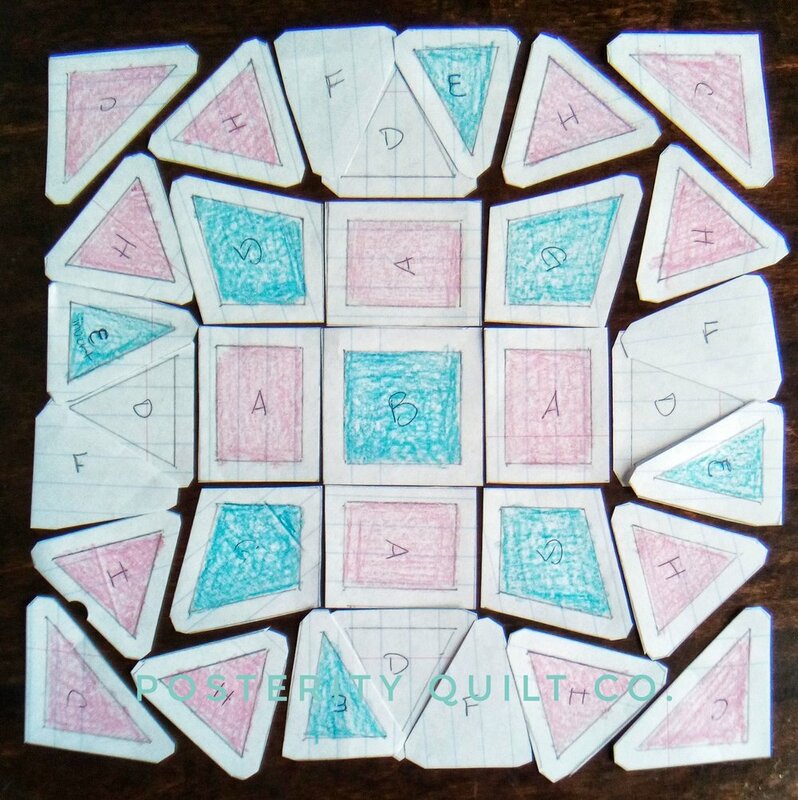 Piece these new quarters together to create your block, and square up to 6". Click here for the original Farmer's Wife Magazine, the letter written by A Child Again in Wisconsin can be found on page 26. Political unrest seemed to be a theme throughout April 1932. Political protesters, both peaceful and violent, where arrested throughout the world. Martial law declared throughout Chile as protests against the countries financial crisis. Hundreds were arrested throughout Germany as violence erupted over Reichstag elections and Nazi Party leadership was accused of an attempted civil war after cashes of illegal weapons were seized from SS offices. Protesters vandalized government buildings in New Foundland as they marched in response to corruption charges against officials. Pro-labor marches shook cities in Australia, and when protesters turned to rioting and looting, 2,000 people where arrested in Auckland. Marches also took place in Ethiopia to protest Emperor Haile Selassie's executive order abolishing slavery. Any time of political and economic unrest is stressful. But when the world seems to be up in arms and your native economy is in the tank, the world can be a scary place. Sometimes just watching the news can be stressful! But then you take a break, you go outside, and you speak with real people and the world goes back to normal. Sometimes just taking a break is all you need to reorient your world and remind you of the important things in like, advice that A Child Again gives. A Child Again's letter to the editor is a gentle reminder to never loose our inner child, and how important that inner child is to development of our own children. This mother's willingness to be present with her children helped them learn and understand a variety of things: she loved and valued them enough to spend time with them; she nurtured their playful side by taking the time to bake miniature treats for the tea party; they were her priority, she left chores undone just so she could sip milk and nibble bread during play time. I wish I was more like A Child Again. Too often I turn down my daughters' requests to play because I'm folding laundry, dinner needs to get started, or I'm too tired. I don't know why finding 15 minutes to play is difficult, but sometimes it feels impossible. Am I the only mother who does this? We all know that our children are our priority, but do our actions actually show them that? How often do things like housekeeping, work, TV, our phone screens take our attention away from those tiny people in our lives? 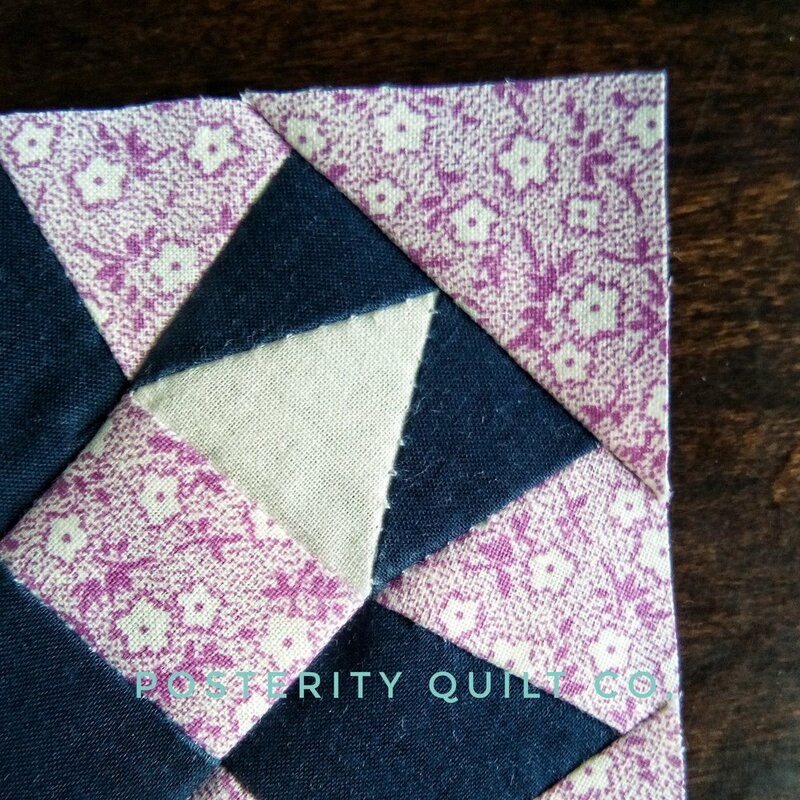 Piecing the Marcella block is simple and strait forward. Piece together the small A triangles to create a large triangle. Then sew onto both sides of the B piece, press flat, and viola! 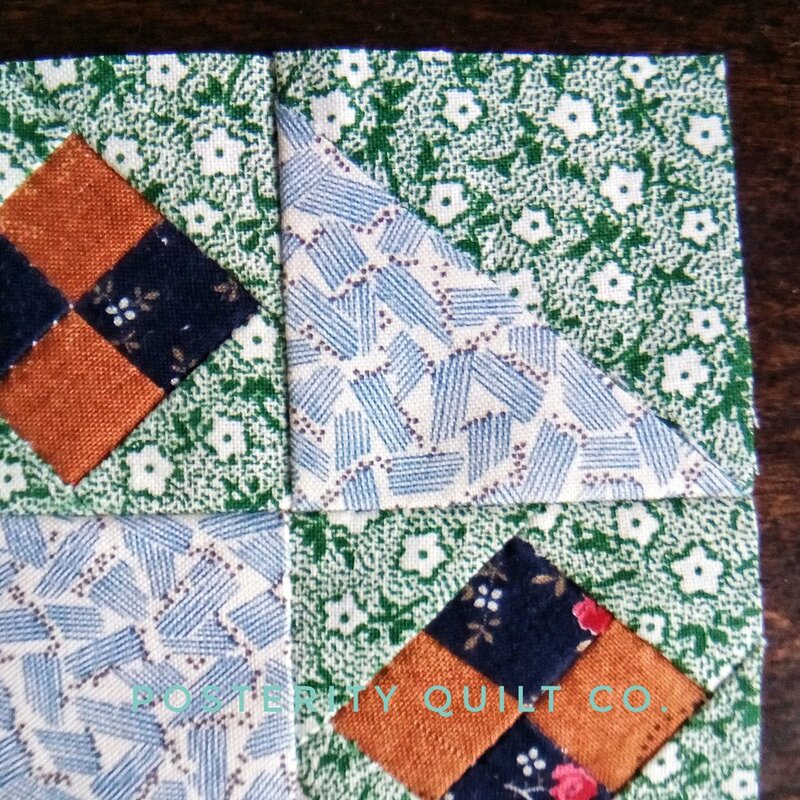 Remember to always square your block when you've finished piecing and pressing. 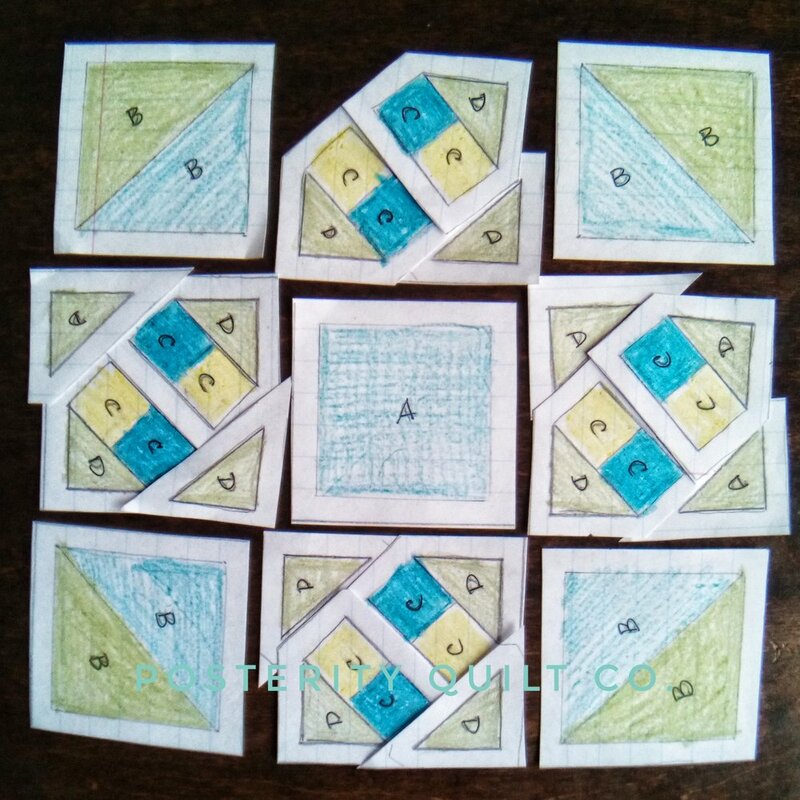 Squaring your block immediately will spare you from having to square them up when all the blocks are finished and are ready to be pieced into a quilt top. Why put off work for tomorrow when you could do it today! B (1) 2 1/2 x 9"
Click here for the original Farmer's Wife Magazine, the letter written by Mrs. M. V. H. in Montana can be found on page 10. February 1936 brought the world together to witness the 1936 Winter Olympics hosted in Garmisch-Partenkirchen in Bavaria, Germany. 28 countries competed in 11 different sports, and interestingly enough 1936 was the last year that both winter and summer Olympics were held in the same host country. Hitler used both Olympics as an international PR campaign to demonstrate German superiority. He built the largest facilities, introduced extravagant opening and closing ceremonies, and even went so far as to "clean the streets" of the cities the Olympics where hosted in, meaning the homeless and prostitutes were forcefully removed. The Olympics were also meant to be a demonstration of the physical superiority of Aryan Germans, but this failed. Germany earned the third highest number of medals, Norway won the greatest number of medals: 7 gold, 5 silver, and 3 bronze. Never the less, the Olympics were a huge success for Hitler. The world was impressed with the organizations, precision, and fanfare of the Games themselves, as well as the aspects of the host cities in architecture, art, and culture. British King Edward VIII attended the Olympics before his coronation and was not shy to give glowing reviews of German society. For many people, the Nazi government was seen as a force that had elevated Germany out of a post-war depression and a stagnant Wiemar government and created a vibrant, robust economic society. Because of this, the shady emergence of the Nazi party might be forgiven. I like Mrs. M. V. H.'s praise she gives to those young flappers that she once ridiculed, for maturing and proficiently stepping into the role of mother. "All of our worries have vanished into thin air," she writes in regards to panic over a sure moral collapse flapper culture would bring. She mentions that they will soon panic over the youthful transgressions their daughters will make, and so every generation will continue to look back fondly on their own past while admonishing the current youth. But I have to wonder just how prevalent the outrageous scenes of every generation are. The hippy love children of the 1960's were not a majority of their age group, Goths of the 1990's were not a majority of their generation, and purple haired Third Wave Feminists are not a majority of the current youth. I wonder if much of their infamy is simply to do because of their outlandishness while, as Mrs. M. V. H. points out that most are "holding onto the fundamentals of decent, happy home life." But even then I'm not sure if Mrs. M. V. H.'s assessment is an accurate of modern America and an idea of decent, happy homes. In 1936 the divorce rate in America was 18%, today it's around 50% and you're even more likely to divorce if you've divorced previously. Millennial (those born in the 1980's and 90's) are less likely to marry at all. I can't help wonder if that's because so many came from broken home's they either don't see the point of marriage or they don't know how to successfully hold onto the fundamentals of a decent, happy home life. Maybe I'm being pessimistic, maybe I'm like Mrs. M. V. H. was in the 1920's and fretting unnecessarily over the future of the nation. Let me know what you think. A word of caution with the Carolina block, there are lots of Y-seams so have those strait pins at the ready! The Y-seams aren't terribly difficult, just remember to mind your seam allowances and keeping seams flat and you should be just peachy. 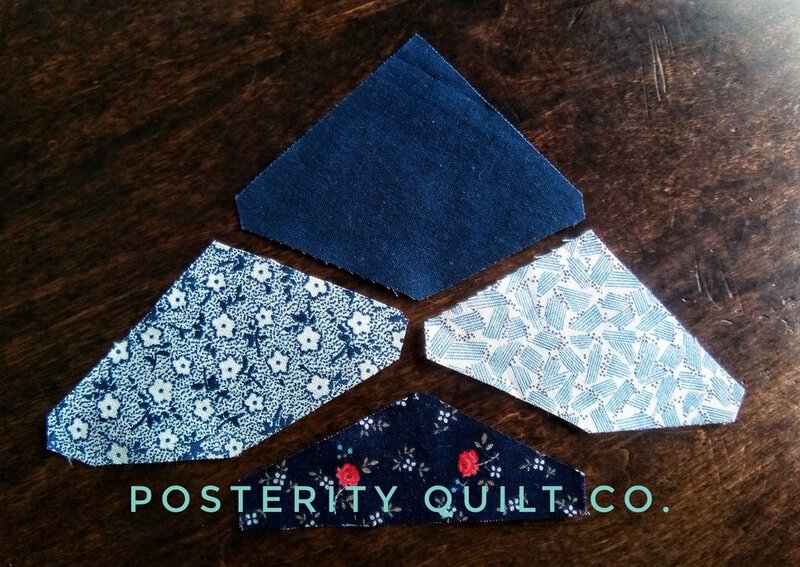 If you're a little nervous about the odd shapes, I would suggest you cut your fabrics slightly larger than the templates and trim down to size after the seams have been pieced and pressed. A (4) 1 1/2 x 2"
B (1) 2 x 2"
C (2) 2 1/2 x 2 1/2"
Click here for the original Farmer's Wife Magazine, the letter written by Renter in Ohio can be found on page 55. Joseph Stalin faced problems in Soviet Russia. Communist programs of forced collectivism caused thousands of Russian farmers to flee into neighboring countries that did not forcefully seize the farmer's privately owned land, equipment, and harvest. In an article entitled "Russia Loosens Iron Grip On Peasants," published in the Chicago Tribune, Stalin officially recognized that collectivist policies only work if they are agreed upon by every member of the community, and every member contributes equally. This letter was shortly followed by international protests lead by Communists against hunger, unemployment, and food shortages in Russia. In the United States the Great Depression continued to grow in severity, a quarter of the US workforce was unemployed. While state manufactured food shortages weren't a concern for Americans, many struggled to pay the bills and keep their homes. I think that's one of the reasons why I have such a respect for Renter's Letter to the Editor. The unsure situation a national economic crisis can shake your confidence, but facing that uncertainty and loosing your spouse could crush a person, but Renter chose to persevere. I don't care who you are, Renter's Letter to the Editor is humbling and thought provoking. Once can't help but take a moment to stop and give thanks for the things you have after reading her letter. I can't imagine the pain and difficulty of loosing your husband to an accident while pregnant and wondering how you're going to feed your other eight children, or pay the rent, and being concerned over your own health condition. But I can admire the thankfulness she shows for the fact her needs and those of her children have always been met even, if their wants have gone unanswered in the past. And the indomitable spirit she shows in the last line of her letter: "I am down, and down bad. But I'm not out even yet," only demonstrates a mother's strength in the face of terrifying adversity. But for the sake of her children she will persist because she must. 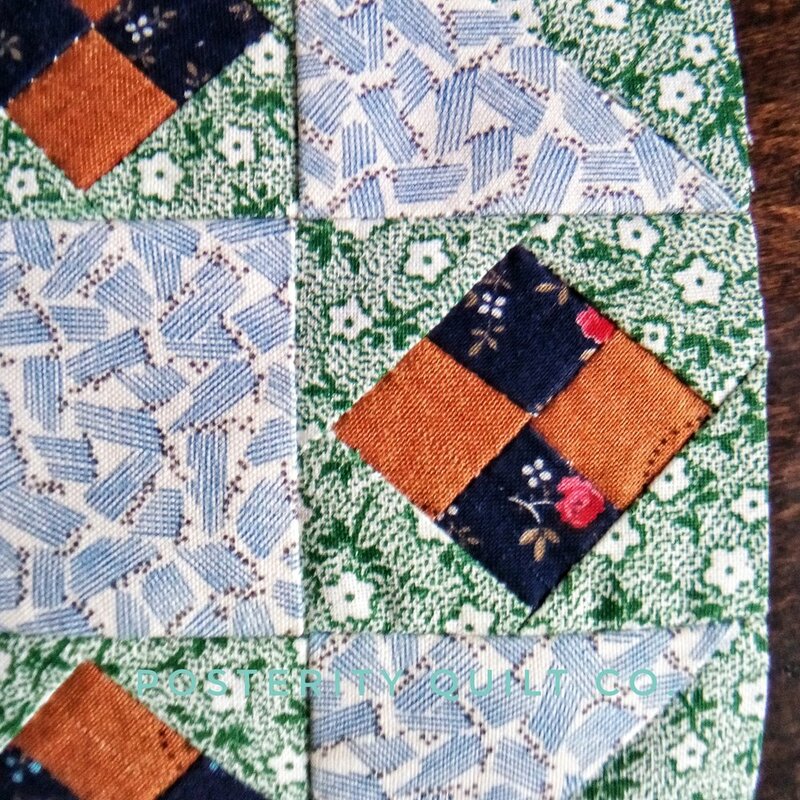 Essentially the Patience block is a 9-patch, although Laurie Hird altered her block in the book for a different look. I chose to go with a traditional 9-patch look. But that's one of the fun parts of a quilt-a-long, every block looks different! 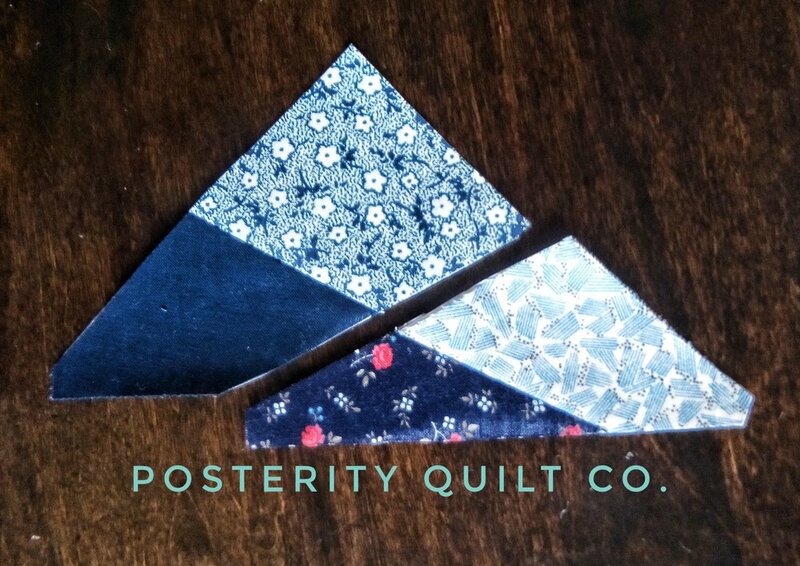 I will also admit to not actually using the paper piecing templates. I measured the templates, those measurements are listed below, and then used a scant 1/4" seam allowance to piece the squares together. 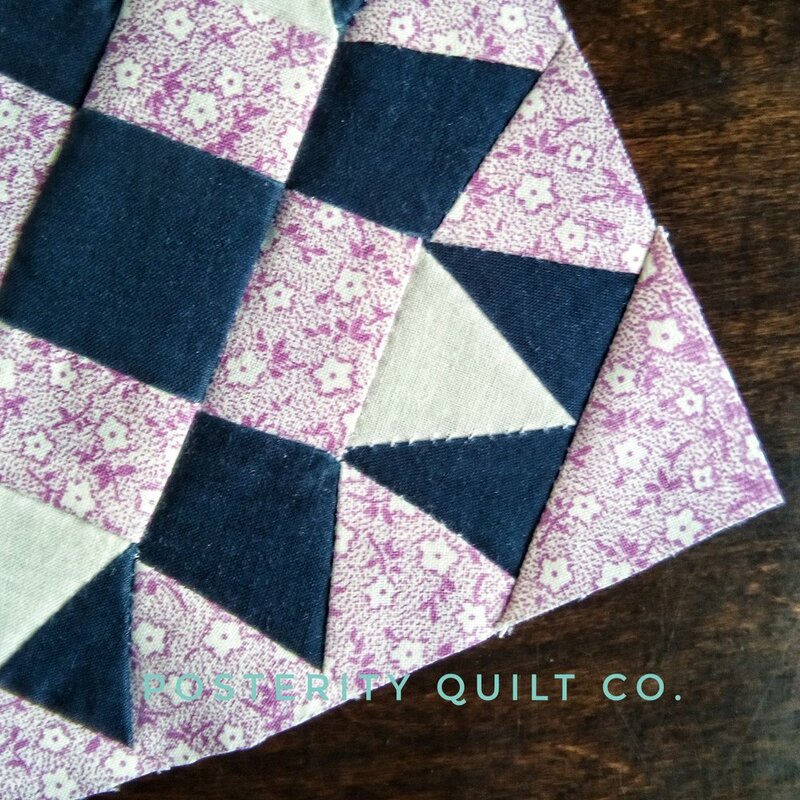 I skipped the templates for 2 reasons: one, piecing was faster without having to to worry about removing the template from the seams; two, pressing seams open is easier, and open seams mean a flatter block! (9) 2 3/8 x 2 3/8"
Click here for the original Farmer's Wife Magazine, the letter written by Just A Tenant Farmer's Wife in Wisconsin can be found on page 8. February 1938 rumbled with global happenings that would come to a head in the form of World War II in a few short years. Emperor Hirohito of Japan enjoyed Adolf Hitler's public support of his invasion of China and the subsequent slaughter, some would say genocide, of the Chinese population. Some estimates of the overall Chinese death toll at the hands of the Japanese range between 20-35 million. In England, political opponents where jockeying for power in a manner that will eventually lead to the nomination of Winston Churchill as Prime Minister. Neville Chamberlain suffered the humiliation of having several of his prominent cabinet members resign in protest of Chamberlain's appeasement approach to growing German aggression. The German Chancellery was taking active steps to increase the German military. Hitler seized the military and made it accountable to himself, rather than an independent branch of the government. He also published the dramatic results of a government program intended to increase the German population. In 1933 the German government began offering newly married couples a $960 loan to set up a new, independent household. For every child born to that couple, a quarter of the loan principle was forgiven; so if a couple had four children within a specific time period, they did not have to repay the loan. Within the first couple years of this program in place, the marriage rate increased 50%, illegitimacy rates fell, and the birth rate skyrocketed by an increased 220,800 births. Hitler's intention was to change German society over the course of a single generation. A young generation he could indoctrinate from a young age (the Hitler Youth) and funnel immediately into military or economic service for the betterment and expansion of German Aryan society. Hitler's marriage loan program started in 1933, Hitler did not successfully annex Austria until 1938 and began to increase German territory. Hitler's vision for an Aryan Europe began years before the first shots of World War II where ever fired. In the Unites States, things where more sedate. Harvard University students started a new tradition of swallowing live goldfish. Gross, but it's safer than Tide Pods I suppose. John Stienback's The Grapes of Wrath was published, and Batman was first introduced by Detective Comics, aka DC comics. The Wizard of Oz debuted as the first film in color. Fans of America's favorite pastime mourned the retirement of the great Lou Gehrig after he was diagnosed with amyotrophic lateral sclerosis, a muscular degenerative disease that now carries his name. For many of American's life continued as normal as they kept their noses to down, focusing on their improving financial situations. Most Americans were unwilling to repeat the Great War, and where content to let Europe handle its own troubles. I love the simple nostalgia that Just A Tenant Farmer's Wife evokes when as she describes a regular evening. The joy of Daddy home from work, a hearty dinner and enjoying the company of your family; simple pleasures that are often overlooked. When was the last time you had an uninterrupted dinner with your family? I grew up eating dinner with my parents and sister every night, and now I eat dinner with my husband and kiddos every night. No TV, no devices, we actually have to talk to each other! I hope the kids appreciate that Handsomepats and I are intentional about nurturing a relationship with each of them. Even though all three of them are screaming at each other right now, I do hope that they look back on their childhood's and remember happy, fun, and sometime's peaceful memories like the one Tenant Farmer's Wife writes about. Construction for the Lucy block is pretty strait forward. 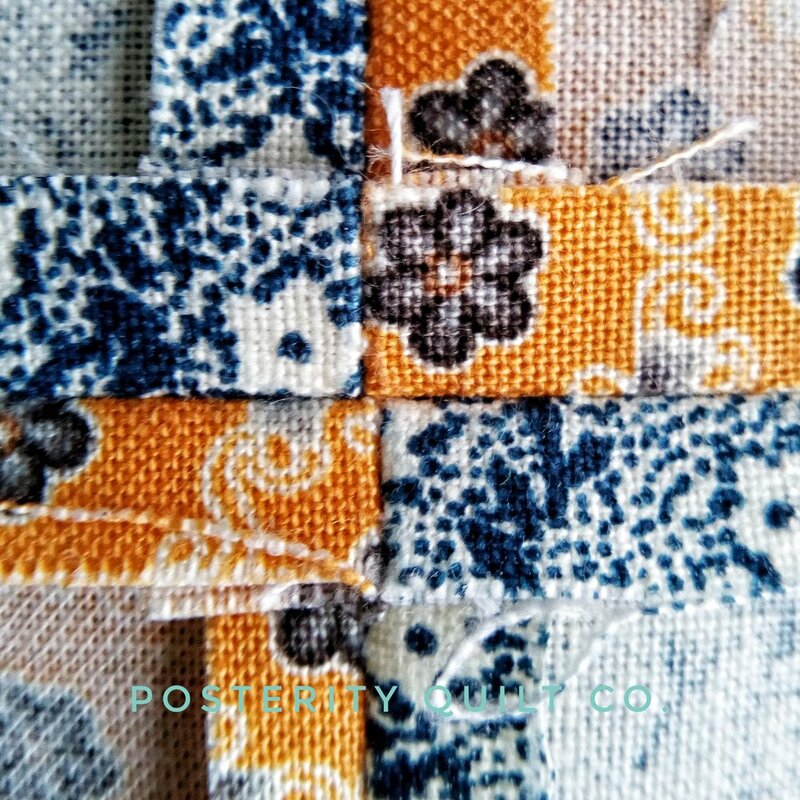 In the pre-cut sizes I list bellow, the D pieces are slightly over sized to make sure that the fabric will meet seam allowances, just remember to trim down to size before you piece the rest of the block together. C (8) 1 1/4 x 1 1/4"